When it comes to food, few people can resist the hot, crispy finish that only a good deep fryer can provide. Whether you’re cooking up fries, chicken, coconut crusted shrimp, or prefer to use it for deserts, you simply won’t regret having one of these great tools in your kitchen at home. What is a deep fryer and what makes a good one? You may associate eating like this with going out, but what if we told you that for the price of just a couple restaurant meals, you could be cooking in your own fryer, saving money and enjoying the crispy goodness? There are units in just about every price range (from $20 to a few hundred for at-home models), so don’t think you can’t afford this small luxury! Most people wouldn’t think twice about spending twenty dollars on a blender or even a toaster, so to get a deep fat fryer for around that price should be an easy decision. There are many brands and many types available on the market today, and we know it’s hard to sift through the incredible amount of information to get the one you really want. 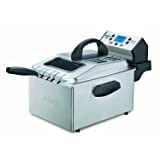 Crispy & Golden has taken the time to do the research, pull the data together, and are happy to offer you comprehensive reviews on the best deep fryers. The first thing you’ll want to look at is our interactive chart of fryers below. We’ve pulled these Top Ten picks from our Full Deep Fryer Guide. If you want to have a more in depth look at your options, we have a list of nearly 30 units to choose from. Remember, the items we choose are the best of the best, so we gladly recommend any of them, it just depends on your needs. A deep fat fryer is a kitchen gadget or device that uses very hot oil to cook food. It is actually classified as ‘dry cooking’ because though it uses oil, it doesn’t use water. Contrary to popular belief, it should not produce greasy food (if performed right). The water or moisture in the food you’ll be frying should be enough to keep the oil from sinking in because as it cooks away, the water will be released as vapor, and the pressure from this release stops oil from getting in. The actual process of cooking happens because the hot oil heats up this moisture in the food, effectively steaming it from the inside. Basket for the food – Rather than dropping food with your hands right over the hot oil and risking getting splashed, you’ll usually find a handy basket for putting the food in, which typically has a method of lower it slowly and safely into the oil. It also will allow you to pick up the food from the deep fryer without having to fish them out with a spoon, for example. Temperature settings – Whether you get a unit with a knob or a digital display, you will likely find a way to change the temperature. 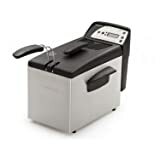 Timer – Some of the mid-high end models have a timer built into them so you don’t overcook your food (if you leave food in the fryer too long, eventually the moisture runs out, allowing the oil to penetrate the food and make it overcooked and greasy). These are very basic features, and there are some models that are much more sophisticated. Some include things like an oil filter to get more use out of the oil (which can save you a lot of money over the life of your machine), while you are beginning to see innovations like food being moved around in the oil automatically, which reduces the quantity of oil needed. To find a good one, you need to set out a number of expectations and figure out what you value. 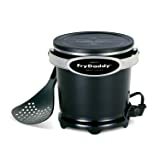 Good is different to each person, so you’ll want to figure out if you want ‘the best you can find for under $50’ or if you want ‘the absolute best fryer no matter how much it costs. This points to an important decision you must make – What do you value most? Is it price? Is it quality over all else? Is it accessories and features? Once you know this, you will be able to make the choice that’s right for you. If you want a really good unit for under $50, then you will know where to start looking and pick the best unit in that range. If you want the most accessorized and feature-heavy unit, you’ll simply look for that one, without regard for price. Because of this, it’s hard to say how you should choose the best one, but definitely be aware of common complaints like seal leaks, difficulty draining oil, temperature fluctuation, and general build quality. OK, so how do you find the best deep fat fryer? Obviously you’ll need to assess what you value (like we talked about above) and let that guide your expectations. After that, however, you are definitely in the right place. Start by checking out our comprehensive and interactive Full Guide, look at our How-To section, maybe even our turkey fryer section, and if you’d like specific deep fryer reviews, we’ve got plenty of those, too. We encourage you to look around Fryer HQ – we’re sure that we have all the information you need to make the right choice. If you’re still not sure, why not head over to our Contact Form and leave us a note? We’ll do what we can to help! Don’t have time to look through our Full Guide of nearly 30 fryers? Not sure which one in the list above is the right choice for you? We knew you might want the most direct answer to finding the best of the best, so we’ve written some quick and to the point reviews below of what we think are the 5 best buys on the market today. We’ve taken into account quality, user experience, and even price, so we are confident that one of these will work for you. Don’t let the simplistic design fool you – this is one outstanding unit. Presto is one of the leaders in this industry and has come up with an incredibly simple, but incredibly effective model in the GranPappy. 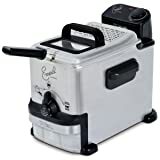 Not in spite of, but in fact because of, the simple no-frills design, Presto has given us the top rated deep fryer on the market today. 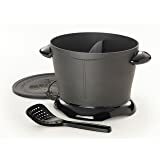 It’s a non-stick cast aluminum bucket that has rubberized feet so it doesn’t slide on the counter, it comes with an easy to use storage lid, and has a slotted scoop to easily put in and remove food with. It’s most impressive feature is hardly a feature at all, just pure common sense engineering…the power cord is magnetic, which means if the unit is moved dangerously at all, the cord disconnects, cutting power and heat, thereby lowering the danger of fire or burns. It packs a real punch with 1500 Watts, which is particularly impressive because of the relatively small size of the device – 6 cups (or just over 1.4 Liters) – which is perfect for a couple of people or for a small kitchen. We highly recommend this unit, which will keep your food at the optimal temperature all the way through the cooking cycle. Click here to see pricing, ratings, and reviews on Amazon.com. Another Presto creation, this one a bit more heavy duty and robust, is next in our list. 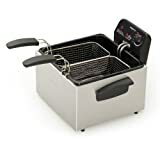 The Dual ProFry has two baskets for frying, which means it’s more versatile than a lot of it’s competitors (though you can purchase a single, large basket separately), and with a 4.7 Liter oil capacity, is on the larger side of the spectrum. You’ll have no problem cooking larger items in here, such as fish or chicken strips. With 1800 Watts, this is literally among the most powerful units we’ve reviewed. Oil stays hot and is well regulated, it’s easy to clean (the whole thing easily comes apart), and it’s easy to store (the baskets fold up inside the unit when not in use). Overall, because of the quality, ease of use, and versatility, we recommend this over just about everything else if you’re looking for a larger fryer. This is a really safe bet if you’re looking for an all around solid model. 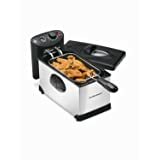 The Hamilton Beach unit has 1500 Watts of power, nearly 3 Liters of oil capacity, comes with a lid to minimize splatter, comes in at around $50, and heats up quickly, cooking food with efficiency. It’s not overly fancy but actually just does what it’s supposed to do, which is great. The cord is magnetic in case it is ever accidentally snagged (great safety feature), and pretty much every piece comes apart for easy cleaning. If you aren’t sure what to get and you’re trying to decide between two units, get this one, as it is pretty much smack dab in the middle of everything feature and price-wise. Solid buy! 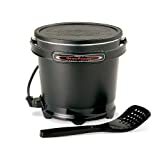 The DF280 is a powerful machine made for cooking up to 2.3 pounds of food at a time. With 1800 Watts, it is right at the top of the list of good fryers we reviewed. You get the option of using either 2 smaller baskets or one large basket, depending on what your cooking needs are, so combine this with the power and you get a very versatile unit. The inside oil container is enamel coated and has a spout for easy pouring and cleaning (it’s also really easy to clean in general after each use). Waring includes a timer on the unit that beeps at you when the time is up, ensuring you won’t overcook anything, and the lid is very helpful for minimizing oil splatter while cooking. 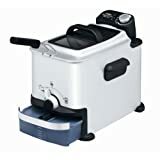 It is one of the best selling fryers on Amazon.com, and has a high rating of 4.2 out of 5, so if you’re in the market for a pretty heavy duty fryer, this will be the one for you! Another larger unit here, with 1700 Watts of power and capacity for over 3 Liters of oil. With T-fal, you get a great name that you can trust to put out a quality product. Other than the power and size of this unit, it is one of the most feature-rich models available. 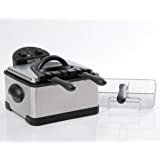 It has an adjustable thermostat, lets you know with a little light when the oil is the right temperature, utilizes a locking, sealed lid that includes an odor filter and viewing window, and perhaps most impressively, has an automatic drainage and filtration system for the oil. When you’re done, the oil drains and filters into a reservoir in the bottom of the machine, allowing you to re-use your oil with ease. Most everything fits in the dishwasher and it’s easy to use and take apart. Overall, this is one of the best fryers we’ve found, and if you’re looking for both power and features, this is a great choice.